Are the Brewers an improved team over last year? What are their chances on winning the Central Division? The Brewers are improved over last year. The acquisitions of Mike Cameron & Jason Kendall will help improve a defense which finished 12th in the National League last year. When you look at this year’s team, there is more maturity and experience and they have better arms in the bullpen. Yes, they are better and now they just have to go out do it. All the teams in the Central improved themselves on paper including the Brewers. The Brewers can win the Central if they play good defense and our young starters Gallardo, Parra and Villanueva continue to show improvement on what they did last year. What happens to Gabe Kapler when Mike Cameron comes back? Gabe Kapler is playing very well for the Brewers and is swinging a hot bat. 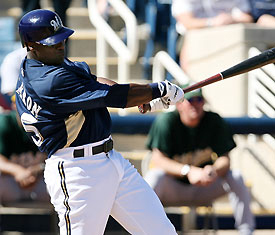 He knows what his role is for the Brewers as do Tony Gwynn and Gabe Gross. Their playing will dwindle when Cameron is back. Manager Ned Yost will try to utilize them as often as possible. Braun, Cameron and Hart will have the bulk of the playing time in the outfield. Will the Brewers ever have Milwaukee on the front of their away uniforms? Never say Never!!!!! 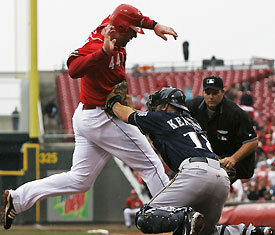 From my understanding the Brewers feel that they represent not only Milwaukee, but the State of Wisconsin. That is why they have Brewers on the front of their road uniforms. However, they do have a “Milwaukee” patch on the left sleeve. Thanks everyone – keep those questions coming!